LARGE FULL ESTATE SALE--COLLECTIBLES, ANTIQUES AND EVERY DAY ITEMS---"NICE SALE FOR RESELLERS"
MOVING OUT OF STATE -- ESTATE SALE--CLEAN SALE- COLLECTIBLES, ANTIQUES, EVERYDAY ITEMS,TOOLS!!!! 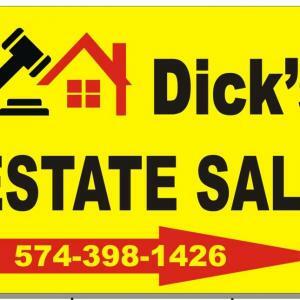 This company has posted a total of 148 estate sales. Only the most recent 50 sales are shown. Thank you so very much for all you did to prepare my mom and dads home for the Estate Sale. Thank your for all the effort you put into going through all the treasures and all of the JUNK! Thanks you for handling it all and handling our family as well, with dignity, grace and professionalism. Your efforts were greatly appreciated.